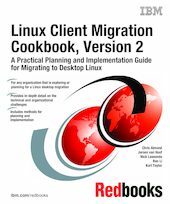 The goal of this IBM Redbooks publication is to provide a technical planning reference for IT organizations large or small that are now considering a migration to Linux-based personal computers. For Linux, there is a tremendous amount of “how-to” information available online that addresses specific and very technical operating system configuration issues, platform-specific installation methods, user interface customizations, and so forth. This book includes some technical “how-to” as well, but the overall focus of the content in this book is to walk the reader through some of the important considerations and planning issues that you could encounter during a migration project. Within the context of a pre-existing Microsoft Windows-based environment, we attempt to present a more holistic, end-to-end view of the technical challenges and methods necessary to complete a successful migration to Linux-based clients.